There is only one place in Sioux Falls where you can build robots, perform in a musical, create pottery and develop installation art with your friends. Last year, over 600 students participated in Pavilion Summer Camps. 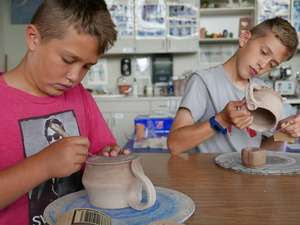 Join us for fun, creativity and learning this summer! There are a wide variety of summer camps for you, to dive into what you love and to find like-minded friends and mentors to help expand your skills. Slimy Slime. Elephant toothpaste. Comic sketching. Clay bowls. Murals. Human shrink-wrap. Robots. Pendulum painting. Zip, Boing, Pow! 3D printing. Come prepared to create, get messy, learn, explore, listen and dive in to all that the Washington Pavilion has to offer. 3. VISIT the Washington Pavilion Box Office at 301 S. Main Ave, Sioux Falls. Offer not available for internet sales. All four offerings must be scheduled at the time of purchase. WHY SUMMER CAMPS AT YOUR WASHINGTON PAVILION? Explore the worlds of art, science and theatre through exciting, educational opportunities. A hands-on approach helps you develop creativity, utilize problem-solving skills and think outside the box. From Toddler Art and RAWWR! Dino Camp, to Kids on Canvas and Technical Theatre Camp, there is something for everyone! 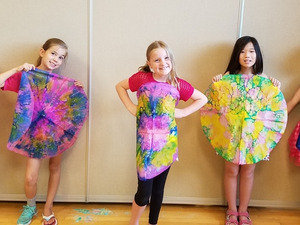 Weekly Summer Camps are available from June 4 – August 16, with multiple opportunities for kids age 1 –18 to get involved each week. Scholarships are available for students with financial need.